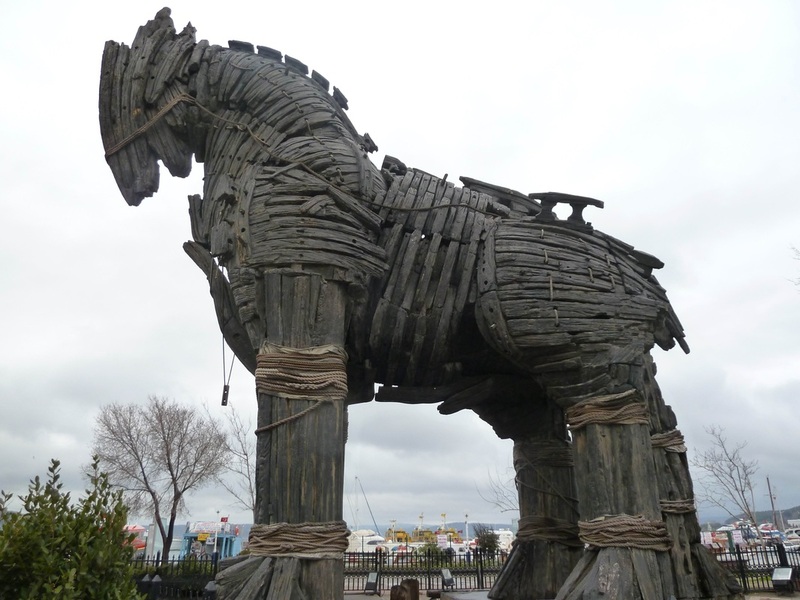 Trojan Horse, however people always wondered if there was really a wooden horse or not, first mentioned in the Odyssey, is a tale from the Trojan War about the subterfuge that the Greeks used to enter the independent city of Troy and win the war. Sacrificial Altar, at the Southern gate part of the city walls. Next to theatre. 3700 years old city walls, in Troy I, the walls were built in a herringbone pattern, which is peculiar to this period. Houses of Troy I , 3000 B.C. – 2500 B.C. , known as one of the oldest megaron type of houses, which is constructed to a long and narrow shaped plan, and consists of a portico and a large room with a heart at the centre of it. The Bouleuterion(Senate Building), originating from the time of Augustus, was a place of political gatherings. The Odeon(Concert Hall), was a small theatre with marble blocks, used to enjoy music performances. Remains of the various cities from Troy I through to Troy IX, excavations have revealed a total of 9 periods of settlement in this ancient city, which was established 5 thousand years ago.